Force India and Red Bull are reported to be in talks to end the long arbitration process over the legality of the Toro Rosso cars (effectively versions of the Red Bull chassis). The demise of Super Aguri, also part of the arbitration process thanks to their use of Honda chassis, has made the process easier and an agreement is expected to be reached very quickly. 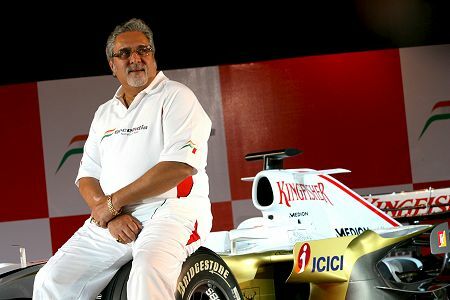 Rumor has it that Red Bull will be paying Force India the amount of 8 million euros as part of the settlement and I cannot help but wonder whether this even begins to cover the legal costs already incurred by Vijay Mallya's team. As I said in an earlier post, the whole business was ill-advised from the beginning and has played a part in creating the sport's present crisis of shrinking grids; it should have been resolved long ago. The real death blow to the cause of customer cars was not Force India's arbitration case, however. It was Sir Frank Williams' flat statement that he would take the matter to the courts if Prodrive were allowed to enter F1 with a McLaren chassis. That led to an immediate capitulation by Dave Richards, the Prodrive boss, and other interested parties, including the FIA. Looking back on the events of those few days, it was as if a group of small boys squabbling in the playground had been told that a teacher was on the way to sort them out. That brings two thoughts to mind. Sir Frank's reaction shows clearly that he has no regard for the internal processes of the the FIA, the WMSC and the Court of Appeal - he knows that the only way to get anything done is to go directly to the legal system outside the sport. And the duck and scatter reaction induced in those trying to gain entry for Prodrive shows that they, too, know that the FIA's legal structure is a joke. I have written before about the concentration of power in the hands of the president of the FIA being an invitation to trouble; but a large part of the problem is also the Concorde Agreement. Originally invented as a way for the constructors to ensure that the governing body kept rule changes to a minimum and gave reasonable lead-in times for those changes, the Agreement has since mushroomed to take in all sorts of regulatory functions, some in direct conflict with the FIA rules. When it becomes clear that many of its regulations are matters of secrecy, one has to think that something is not quite right. Since when has a sport been run on regulations only guessed at by the outside world? Max Mosley had a lot to say last year about F1 being brought into disrepute and he is currently being hoist by his own petard on that score. But how much more does the organization itself invite contempt when its structures are so poorly designed and chaotic? Should it really be necessary for participants in a sport to resort to the legal system every time there is a problem of any magnitude? Having two bodies making rules for one sport is obviously a recipe for confusion and disaster. The embarrassing saga of Mosley's desperate rearguard action against resignation as FIA president is surely a sign that the governing body needs a complete restructuring and clear-out. Part of that should be a return to the old system of the FIA overseeing its responsibilities while more specialized functions are carried out by satellite bodies such as FISA. And those satellites should include representatives, not just from the FIA, but also from the participants. In the case of F1, that would be the team owners and there would be no need for such anomalies as the Concorde Agreement. Formula One is facing perhaps the most difficult period in its history as it strives to be relevant in the 21st Century. To meet the challenge, it is going to have to be much more efficiently run than is possible in its present structure. It is time that those involved took a step back from their own little realities and came together to create a better way forward for the good of the sport. Every time I read anything about how the FIA operates I lower my opinion and expectations of them. In today's Autosport it mentions that in the event of Max losing the vote of confidence there is no procedure in place to remove him from his postion. It is insane. If he loses the vote he keeps his position unless he resigns. I must apologise for Formula1Sport's problems at the moment - the site was attacked by a hacker a few days ago and was down completely for a while. Then the owner decided to upgrade to the latest version of WordPress as part of the fix and to prevent future attacks. Unfortunately and as happens so often when upgrading, this has led to further problems, the disappearance of the Comments box being one of them. We are working on getting everything running smoothly and should have it all back together again sometime today. Thanks for your patience through all of this. I wouldn't get too excited about the Force India/Toro Rosso deal. The 8 million, from what I can tell, is an opening offer of fresh talks. It doesn't mean anything will come of it, because Force India need to know where exactly the customer car situation stands before it can let the matter go. Otherwise it'll just have to go through the whole procedure again next time someone spots the loophole in the FIA's bizarre interpretation in its regulations. Someone or something has to oversee the FIA, and it needs to be someone/something faster-acting than the Court of Arbitration. I've made a comment on another site that Mars may be colonised before a decision is reached concerning customer cars from them, and I wasn't entirely joking. The Concorde Agreement was supposed to be that power ensuring that the FIA stayed within its allotted boundaries, but the FIA has ignored its constraints, which is part of the reason why we're in this situation. I would suggest that the group be framed broadly as per the FISA Clive suggests, but there would still need to be a Concorde Agreement to make sure the supervisory body didn't go astray. I agree with all of what you say, Alianora, in essence. But I still feel that the Concorde Agreement is superfluous and leads to contradictions in the rules and their interpretation. If the FIA's house could be cleaned out, it would then be able to function as the impartial body overseeing FISA's governance of the sport. My friends above are discussing "management" issues of F1 but let's have a second look at the last paragraph. "as F1 strives to be relevant in the 21st Century"
Today's F1 racing is as 'relavant' to motorcars as horse racing is to house pets. F1 "relavancy" has already been lost, the challenge is to get it back ! And I doubt "management" alone can do that. been around for years and years starting with the first reasonable production electric cars and improved with recent hybrid cars, don't mis-understand me, F1 will magnify the technique but the "relavancy" of F1 is the issue. What F1 is doing now is near meaningless, the little Honda mustache wings would do a lot for my BUICK !!!! Modern F1 carbon brake rotors are a wonder of the world but even Jet aircraft don't use them and their cost is prohibitive for use on a Toyota Corolla. Renault's mass dampers won't do much for your car, you get the picture. Much of modern F1 is irrelavant. Carbon fiber horse shoes in leiu of forged steel ....... hmmmm? One could question if "relavancy" is even issue any longer. Things aren't going as they SHOULD but we still come back, don't we? Couldn't agree more, Number 38, but I have to use what I can to influence the minds of others. And "relevancy" is a catch phrase that can pull in a lot of voters - never mind that it's meaningless, especially in F1. Since I fear for the future of F1, going in the direction it has been in the last few years, I have to use writers' tricks to get the message across. If I just said "let's turn the clock back a few decades", they wouldn't listen; but, if I can convince them that "relevancy" dictates we change direction, I might just get things improving instead of degenerating into a test facility for the motor industry. You are a master with words, no argument from me!!!! F1 is somewhat trapped in the doldrums right now, after the MadMax and Bernie era we'll see changes, it just requires some patience. Of course I'm expecting changes for the betterment of the SPORT, not just change in the political sense. Fingers crossed. I didn't read "relevancy" as "relevant to motor cars"; I thought Clive meant "relevant" as in "finding a place for itself within the way the 21st-century world works". I remain convinced that that place is as a high-octane sport, not as a marketing exercise or a psuedopolitical mess (which the powers-that-be seem to think it should be). The confusion from the powers-that-be is precisely why a Concorde Agreement remains necessary. Even if the FIA was tidied up, something would need to be in place to prevent those holding power within the new structure from losing their way. While putting people over the FIA will work, it relies on the FISA people not getting addicted to power with the resulting abuses. That's where Concorde comes into play. A document to remind everyone what they should be doing, that people can refer to in cases of power abuse or even when there is a risk of people forgetting where F1 should be and how it should get there.